Students who are looking for ways to become an art teacher actually have a few great ways to turn their natural interest in art into a long-lasting teaching job that fosters the same interest in younger students. This is actually a pretty popular career path for those with a significant interest in art, since it gives them the ability to hone their craft and seek a reasonably well-paid job that puts it to use on an almost daily basis. With several great ways into this profession, artists and aspiring art teachers can even choose the schedule and curriculum that most aligns with their own strengths, interests, and academic needs. Though it was once a pretty rare find, the Bachelor’s in Art education degree has become increasingly common on college campuses in the 21st century. That’s partially due to tightening regulations in state public education systems, which require new teachers to graduate with a combined degree that emphasizes both the basics of education and a specific area of academic content. Art education programs will effectively see students dedicate the majority of their major credits to art, with course that focus on education at the primary and secondary levels in today’s schools. These education courses teach lesson planning and pacing, curriculum and instruction design, classroom management and student-centered learning, in addition to an area of artistic focus. Some schools simply lack the art education program, and instead encourage their students to major in a given artistic pursuit while minoring in education. This results in the graduation of a student who can teach art only in high schools, rather than one qualified for both primary and secondary school placement. 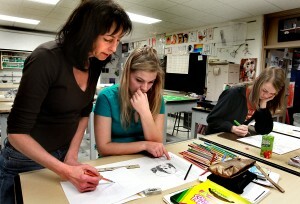 Art students in this program do take more art classes than they would in an art education program, but the education courses they take are suitable preparation for instruction of students in the secondary grades. They’ll learn more about adolescent education and classroom management in these courses, since that’s the level they’ll be licensed to teach. Another popular way to turn an interest in art into a profession in the classroom is simply to pursue these interests on separate schedules. A large number of today’s artists actually attend a prestigious art school and major in a specific area, like painting or sculpture. After four years, they’re among the best artists anywhere in the country. Perhaps they take some time to further hone their craft on their own, and then they enter into a post-baccalaureate teacher education program. These programs are usually offered either as certificate programs or as grad school offerings. Either way, they produce candidates who are eligible for the PRAXIS Art Education exam. Upon finishing the degree and passing that exam, students will be awarded a state license to teach art to students in grades 7 through 12. Art is one of the few fields that actually benefits from pursuing an education component at a later time. According to Teach, those who wish to become an art teacher should first hone their craft and polish their skills, pursuing educational licensure only when they feel confident enough to teach art to children at either the primary or secondary levels.